For quite a long time I didn’t know that the term “Azores High” or “North Atlantic Subtropical High/NASH” refer to a group of Islands far out it the North Atlantic. Why should I? Surfing hasn’t been on my map until 2004 when it surfaced with a bang and took less than a year until I knew: it would change my life forever. Around that time I was browsing through the Stormrider Guide Europe (offline, imagine this!) to stumble upon the last few pages. Immediately, words like “Remote islands”, “swells in abundance” and “freight trains” started spinning around in my head. I knew I wasn’t ready for this and it should take me 11 years until I finally touched down on Sao Miguel, the main Island of the Azores. São Miguel – known for it’s beauty and also known as “The Green Island” – is the archipelago’s biggest island and home to the administration. With it’s 62.1 km in length and 15.8 km at its maximum width it is home to more than half of the Azorean population (137.856 in 2011). There are several volcanoes on São Miguel hence you can see the signs of volcanic activity all around the island. 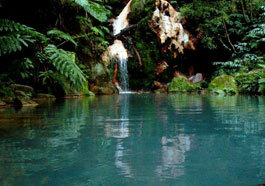 Hot springs, fumaroles and even a geothermal heated surf spot in Ribeira Quente. Of all the volcanic peaks, Pico da Vara (1,105 m) is the island’s highest point. Ribeira Quente on São Miguel’s south coast. Thanks to the Gulf stream, the climate on the Azores is very mild. With average temperatures of 16ºC (61ºF) during spring, 21ºC (70ºF) in summer, 18ºC (64ºF) in autumn and 14ºC (57ºF) in the winter it is not what you would expect in the middle of the Atlantic Ocean. This contributes for the luscious flora with beautiful flowers and cultures like the pineapple, tea, tobacco etc. The best (and maybe only) way to get along on the Azores is a rental car which brings you to almost any point of the island within an hour driving. The distance between the capital, Ponta Delgada in the south and Ribeira Grande in the north is 20 km. The connections are very fast, except at the far northern and eastern corners of the island, where the lack of highways makes you slow. Those winding roads are in very good condition, though and it’s a very scenic drive around. What and where to eat. The Azorean diet is based on everything that comes out of the ocean and vegetables. As São Miguel is very green, the can produce their own. Soon you will recognize that no matter where you go, cows are grazing on lush green meadows so it’s no wonder that local dairy products and meat are on the menu as well. It’s not hard to eat good and healthy and we made a list of restaurants we personally liked the most. One of the must do’s is to try out the cheeses from the different Azores islands. We liked the one from São Jorge the most. 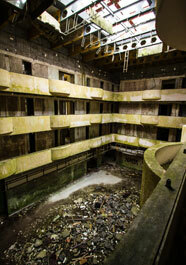 Sete Cidades and the abandoned Hotel. The crater lake of Sete Siudades. 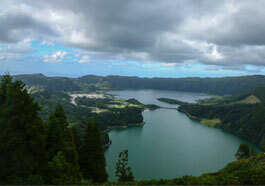 Sete Cidades is the name of an old volcanic crater that formed a lake of time. It’s name literally means “seven cities” although there is only one small. It’s a very beautiful place and you should consider taking a walk. There are several scenic routes like around the lake or – for the more persistant – along the crater rim. There is also a very fascinating sight that made it to an internet phenomenon: the abandoned and completely looted hotel “Monte Palace”. Well, it doesn’t look like a palace anymore, but it probably attracts more daily visitors now than it has in it’s entire time of operation. Which was around 13 month to be exact. If you need some serious relaxation, we recommend a visit to the Poça da Dona Beija close to the village for Furnas, it’s the typical Azores hot spring experience. 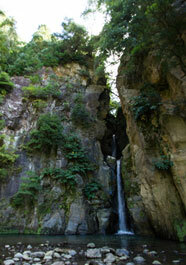 The warm water comes from a natural hot spring and therefore the basins vary in temperature, getting colder downstream. The calm atmosphere make it the perfect place to end a great day at the southern beaches. 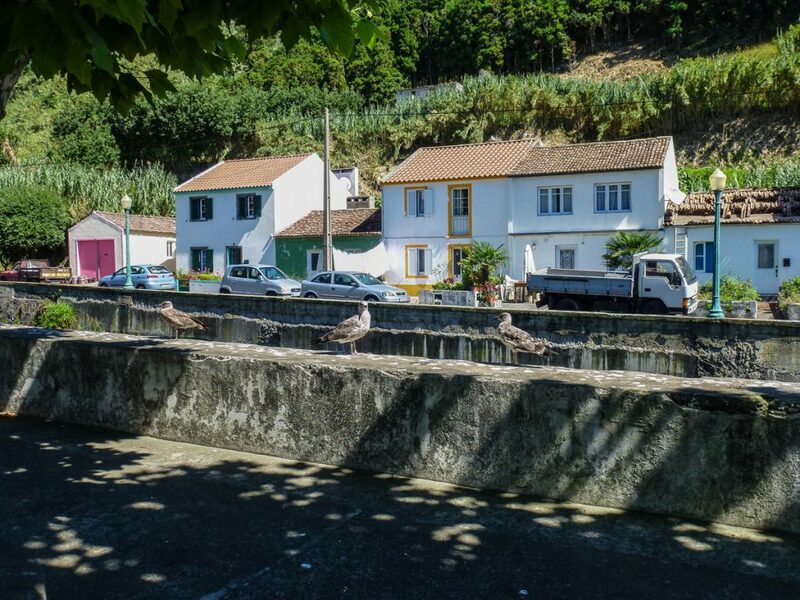 Another place to take a bath is Caldera Verlha on Ribeira Grande’s hillside. 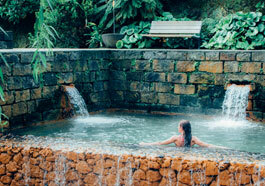 In contrary to Poça, it is a cluster of natural pools shaped by a hot spring. It’s very touristic so your best bet is to hit it either before the busses arrive or towards the evening. Check the opening hours before going. The waterfall itself isn’t very spectacular in fact. But you can hike along the pipeline of the hydroelectric plant and find yourself in the middle of the jungle, picking wild citrus fruits from trees. We were strolling around for two hours without seeing anyone and next time we will bring our slackline to set it up across the river. Thanks to their location in the middle of the Atlantic Ocean, the Azores receive swell in abundance. Out of a total of 7 weeks spent on São Miguel, we could go surfing somewhere almost any day. Most of our off-days, we just didn’t want to hit the water because of laziness, sore arms or other plans. A list of the most popular surf spots will be published here soon.